Many of you tell me that things start to change at your company when the number of employees on your team begin to climb north of 50. It’s not an exact number, but things certainly do change when you don’t personally know everyone on the team any more. Combine this with constant change and frequent pivots and it begins to challenge the leadership skills of even seasoned Founding CEOs. I see many Founders tackle this with different approaches. Some, like Tony Hsieh, of Zappos, even change their entire organizational structure in order to deal with the growth of their organizations. You know that startups often move from complicated to complex when scaling quickly. You experience that daily. 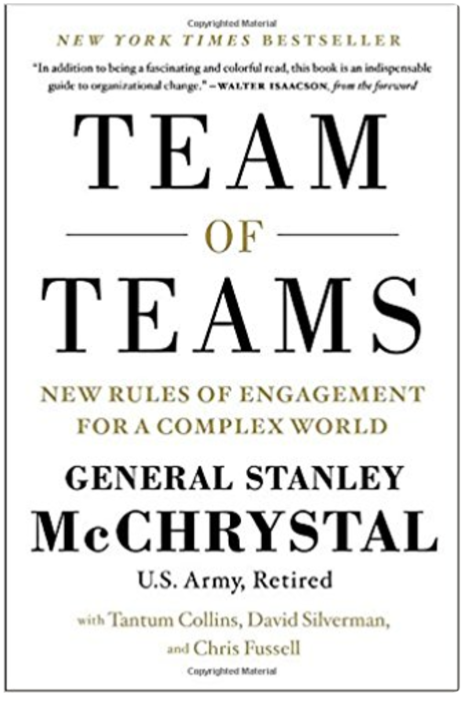 That’s why General Stanley McChrystal’s book, Team of Teams: New Rules of Engagement For A Complex World, struck me as an interesting book to add to your reading list. Which quote strikes you the most?